There is a persistent focus on tourism receipts to gauge the health of the Greek economy as it heads into the fall and winter. Tourism receipts have, in fact, been dismal in 2010, falling 12% on a year on year basis in 1H 2010 (earnings in January-June 2010 versus January-June 2009). But this cyclical downturn – which started in Q4 2008 – masks a broader decline in the sector that needs addressing. Start with the big picture. Over the past decade, tourism has made a progressively smaller contribution to Greek exports: in 2000, Greece received €10 bn from tourism, a number that grew just 3% over a whole decade to €10.4 bn in 2009. 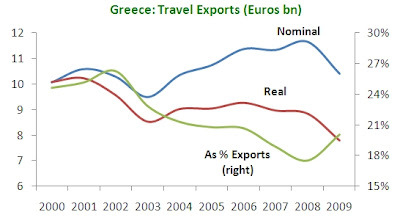 Given inflation in this period (the price level in Greece was 40% higher in 2009 versus 2000), in real terms, Greek tourism brought in 22.5% less revenue in 2009 than in 2000. 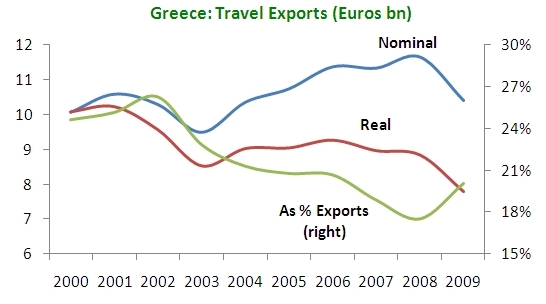 As a result of this stagnation (or decline), Greek tourism made up 25% of exports in 2000 but only 20% in 2009. Since 2003, the important of tourism as a share of total exports has fallen each year with the exception of 2009 – although this was because other exports fell more than tourism rather than because tourism performed well. The data to investigate this further is not very good (or at least not as easily available) but some high level conclusions can be generated from the table below. Spending per night has been stable and in fact grew modestly between 2005 and 2009. However, spending per trip has fallen for independent travelers, who spent 10% less per trip in 2009 than in 2005. A similar, but less pronounced, trend is visible for packaged tours. Obviously the key here is duration of stay which fell 12% for independent travelers and 7.5% for packaged tours. What these statistics make clear is that on top of a cyclical decline in tourism receipts generated by the economic crisis (and perhaps some image problems), the Greek tourism sector needs to face up to its broader decline in the Greek economy. With stagnant revenues in nominal terms and a real decline in real terms, Greek tourism needs a re-think if it hopes to remain the pivotal driver in the economy that it once was. Very enlightening and informative. Many thanks and please don't stop. 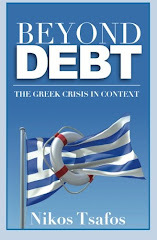 Truth Commission for Greece’s Finances? Focus on Unemployment: Does Education Help?